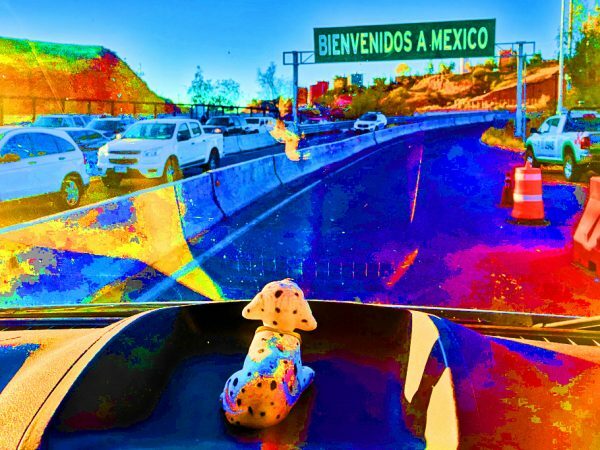 Bienvenidos a Mexico! Bob is so happy we brought him with us this time even if I do make him take off his hat for the crossing. We are currently in Sinaloa Mexico just north of Mazatlan. Today we bring you another installment of Nomading by the Numbers where we count up all the interesting, curious or sometimes mundane things we did the past month that didn’t really fit into a blog post but will hopefully give you a little glimpse into our daily lives. 54 – The number of polydactyl (six-toed) cats that lived at Hemingway’s Key West home and survived Hurricane Irma when she hit the island last year. Perhaps those extra toes gave them a little extra grip when Irma’s winds blew? 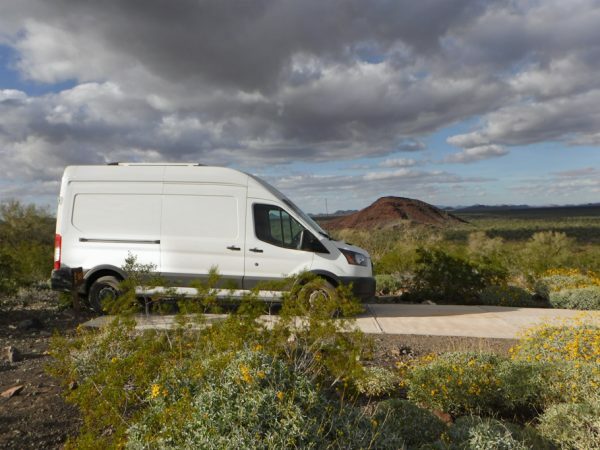 18,640 – miles in the Pan-American highway. OK – I’m not really sure on this one, but I Google it and that is the number that popped up at the top of the page – although specific websites give other numbers. Anyways, according to the Guinness World Records, it is the longest “motorable road” in the world stretching from Alaska to the tip of Argentina. Maybe we will drive it someday? OK before we get to our numbers here is a little wrap up in words. November was all about getting ready to go to Mexico. We are fortunate enough to have great friends in Tucson, AZ and were able to camp out there most of the month to prepare. On November 29 we finally crossed. Enough of that! On to the reckoning! Our camping spot in the Kofa Wildlife Refuge at Palm Canyon was beautiful. There are at least three other roads to drive down to find camping in the refuge – we might try one of the other ones next time. We love camping free. 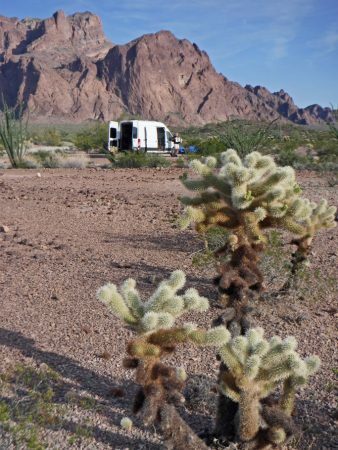 It is quite easy out west as there are lots of free campsites. It will be a lot harder in Mexico, but we hope to mix enough free camping with paid to keep the cost down. 8 – Trips to the Tucson library. When we first started on this land traveling life we thought we’d be spending a lot of time in libraries taking advantage of their free Internet but it turns out it is so much easier to just find a parking spot close to the entrance of a Lowes and use their free wifi from the comfort of the van. Since we were going to be in Tucson so long we thought parking in front of Lowes every day for hours might be a bit suspicious – so off to the library we went for our research. It seems libraries are a bit different from when I was growing up. Now they seem to be more like community centers than places of study. People crowd the computers playing games and checking their social media. They eat their breakfast burrito while reading the newspaper. They take naps. And really who needs WeWork when you can run your office, interview potential employees, and make business calls on your cell phone at the library? Kids gather after school and play card games and music classes are conducted in open door meeting rooms. Got a little sticky situation with the law? Have a very loud conversation with your lawyer on your cell about the whole shady business – at the library. It wasn’t too long ago I was in an Atlanta library when I saw a librarian call out a patron from across the room for talking on his cell phone. A little Atlanta librarian could go a long way in Tucson. Instead of spending our first night after seeing the dentist in Los Algodones, Mexico in the Quechan Casino as we had done earlier this year we drove out to this bit of BLM land just 20 minutes away fron the border. It is a boring site, but good for a free night. 103 – Airbnbs in Mexico City I had saved until I discovered that none of them would be able to accommodate the van. We are meeting our friend Wayne in CDMX at the end of the month and it seemed like it’d make everything easier just to get a room for all of us until I realized the van problem. Every place I saved either had unsecured street parking or the on-premise parking was in a parking garage with an opening just too short to allow Ballena Blanca access. So I broadened my search and after 3 days I finally found the perfect place with gated/not garaged off-street parking. 85 – House sitting dates on our calendar for next summer. (Up 19 from last month). Futura Pond was a real find while we were waiting for the dentist in Los Algodones to make Greg’s crowns. Who knew there was water like this in the desert? It was a bit crowded, and lots of people were fishing when we arrived two days before Thanksgiving, but thinned out considerably on Thanksgiving Eve. I think a few of the campers were living there permanently. 9 – Times crossed into Mexico this year. 6 – Times on foot, 3 when we visited the dentist in Los Algodones in February and 3 when we just visited the dentist this past month. 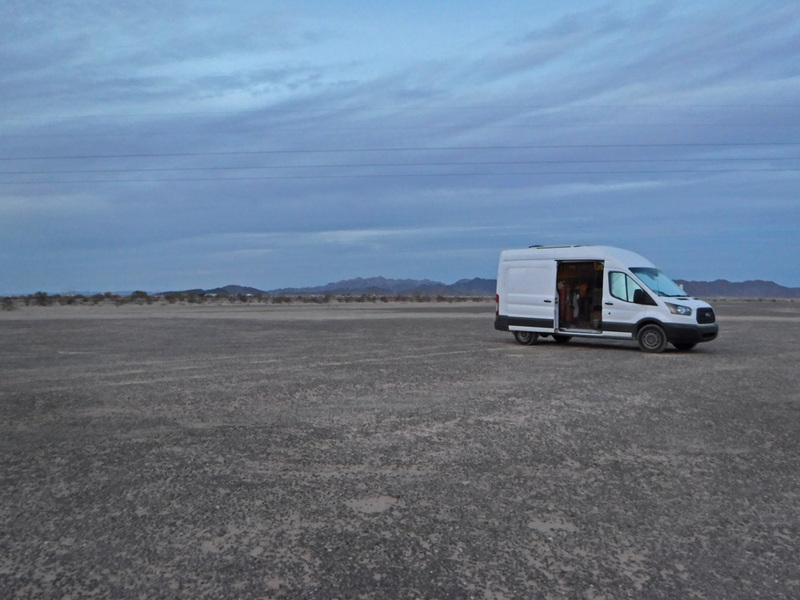 2 times in the van when we went to Baja earlier this year and when we just crossed into Sonora last month. 1 time by rowboat when we visited Big Bend National Park in January. We spent 2 nights camping in El Pinacate in Sonora, Mexico. The first was in the campground and the second in the parking lot at one of the volcano craters. This is that second night at the crater El Elegante. 150 – Views on the blog in one day. No, I didn’t write an absolutely fabulous blog that went viral that everyone had to read. This 150 mostly found their way to us from a link shared on a sailing forum to an old blog post about Greg rebooting the mast. This stuff happens from time to time and I always find it interesting that people we don’t know or who aren’t subscribed to blog find their way to our little website and that they find it useful. We actually appeared to have gotten a few new subscribers that day too. I wonder if they will be disappointed to find out we aren’t really a sailing blog any more. 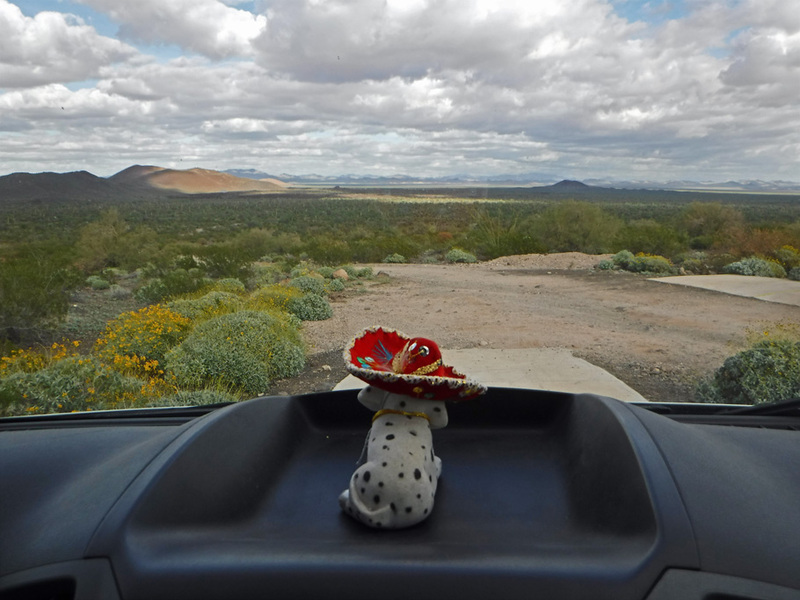 Bob looks out at the scenery from our parking spot at El Elegante and thinks it isn’t a bad spot to spend the night. 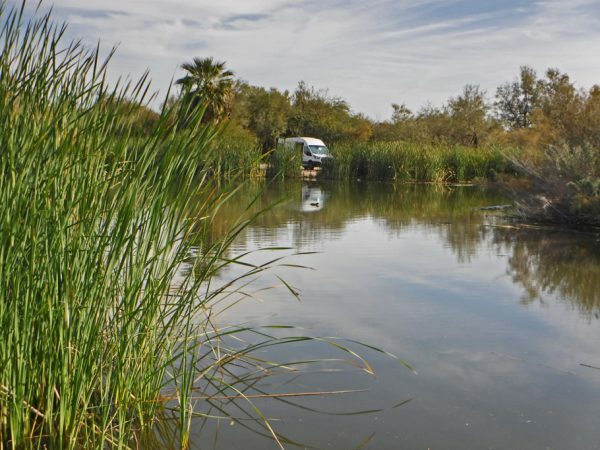 This entry was posted in Nomading, Nomading Numbers and tagged Arizona, boondocking, Kofa National Wildlife Refuge, Mexico. Bookmark the permalink. That’s an interesting list of numbers! We drove a big chunk of the Pan-American Highway, from Alaska to the end of Panama. I hope Google also mentioned that the road stops there and doesn’t continue on into South America. I starts again in Columbia. Free camping is the best! I hope we will be able to keep up with that in Baja whenever we go. Funny how many times (and in different ways) you crossed the Southern Border this year. We have been visiting many libraries recently and what you describe sounds familiar. I want my peace and quiet there, but often, the places are overrun and full of homeless people. Good tip about Lowe’s. We sometimes go to Walmart for free WiFi, but have not been able to park close enough to stay in the van. PS: I never get notified about your replies to comments anymore. Not sure why. There are a few WordPress blogs I follow where this problem occurs. Yes, I am aware of the Darien Gap. I have read that some people try to drive it with 4WD vehicles but that it is dangerous. Not sure I want to do the whole Pan-American highway – but kudos to you for doing the North America half! Lowe’s seems to have a pretty strong wifi signal. It is nice not to have to get out of the van. Sometimes I use Walmart wifi to do things like downloading maps to my phone. I just hold the phone in my hand while we walk around the store shopping. I can never find anything in Walmart without walking around the whole store – I think they design it that way. I hate it for you that you lost out of house sits because of height restrictions. I am glad we are no taller than we are, about 9 1/2 feet – I worry about going under Bridges and such. And, of course, like you parking garages are out of the question. Not sure why you aren’t getting comment notifications. It might depend on what format I reply. Sometimes I am able to use the WordPress app on my phone, but a lot of times that doesn’t work. Then I have to log into the site to reply. Hope your latest house sit or where ever you are in Zesty is going well! You do a great month by numbers post – very entertaining, informative and downright fun! I’ll have to ask my sister about her thoughts on libraries changing over the years (I’m currently visiting her in Portland). I know the library she works at has a big social/community focus with many homeless visiting it during the day. Thanks Ellen! Keep encouraging me and I will keep doing them! We always think of your sisters whenever we go to a library anymore. Hope you are having a nice time in Portland. Will you guys still be in Mexico in April? I’m planning a trip with my friend Craig. Not sure exact dates or locations yet, but almost certainly Mexico City plus one other location (maybe Puebla). Hey Rick! If we are still in Mexico in April we will most likely be heading north back to the US. Hopefully by then, though, we will be able to give you some tips on places to go. Check out my map in previos Numbers posts for lots of different sights. Have a great trip!